I guess the preserves interlude inspired me to…well, wrap up this T-shirt and acknolwedge that I didn’t like the yarn all that much to work with and so wasn’t going to stick out out for the full length. The yarn was a novelty yarn, Ranee by Kertzer – I got it for $1 a skein so no harm, no foul. 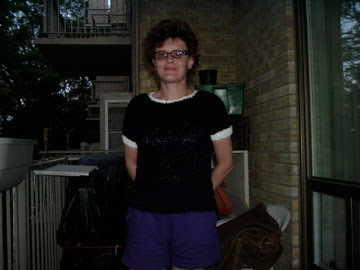 The pattern was adapted from a tunic pattern in the Knit.1 summer edition 2007. I liked the tunic but should have figured that this yarn (which is heavily patterned) would not show it off. Oh well! Have cast on for another t-shirt using hemp. So far, so good!